I’m taking part in #TwelveLoaves with this month’s theme, Clean Slate. Take a gander over at Cake Duchess‘s blog for all the yummy breads baked for this month’s challenge, and to learn more about #TwelveLoaves. It’s a pretty swell idea. Tell me you feel it, too: This thing they call cabin fever. It likes to sneak up on me a few weeks after the holidays (which were less than a month ago… anyone else feel like it’s been for. ev. er. already?) and overstay its welcome through early spring. Now living in the North Star State, wherein many a cloud loves to linger — and linger and linger — when the winter months are well settled in and the flora and fauna in full hibernation, sometimes the best way for me to get a little spurt of energy and happiness is through my kitchen. 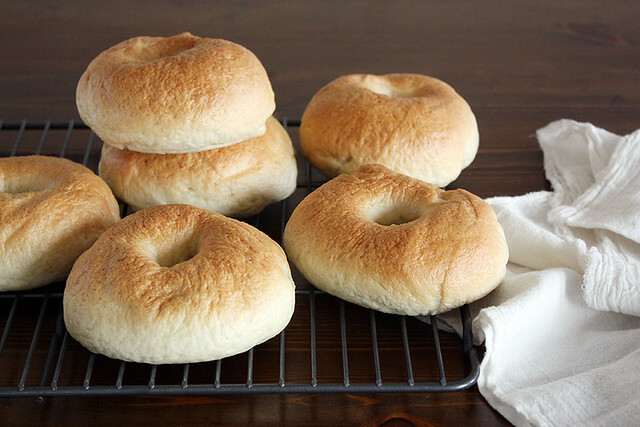 I can only speak for myself when I say that bagels are some of the best things ever created; though I’m sure, if you’ve ever tasted a homemade bagel fresh from the oven, chewy and flavorful and slathered in cream cheese or butter, you would certainly agree. I can go for all sorts of toppings and fillings — poppy seeds, minced onion, garlic, cheese, cranberries and nuts — but if the bagel’s not absolutely chewy, in the way only a standard New York deli bagel can be, then it’s not going into my mouth. Those might be harsh words to the bagel population, but so it is. Truth be told, I’ve stepped foot exactly once into New York City (as in, out of the airport, into a hotel overnight and back to the airport in the morning), so I can’t say for sure that these bagels have the exact same taste and texture as their authentic counterparts. But I have stepped foot into many a deli selling the type and eaten many a bagel, and in my 25 years of existing and bagel-eating I can assure you that, based on experience, these are as close as I’ve ever gotten in my own kitchen to the versions I’ve tasted — especially in just a few hours. I love not only the classic taste and texture rendered by this recipe, but the fact that it’s completely uncomplicated, as a good homemade bagel recipe should be. These things — so basic in form and flavor — shouldn’t take anyone longer than an afternoon to make. They shouldn’t require strange ingredients or methods. They should be simple and efficient. They should be able to hold up to the slice of a serrated knife or the tear of a hungry hand. They should taste delicious with compound butter, cream cheese or a layer of lox. And they should be able to, if only for a meal, cure a case of cabin fever. These bagels do all of those things. In a small bowl, add yeast, sugar and 1/2 cup of the warm water; do not stir. Let mixture sit 5 minutes until yeast is foamy, then stir with a fork until yeast dissolves. In a large bowl or bowl of a stand mixer, stir together flour and salt. Make a well in the center; add yeast mixture. Pour 1/2 of the remaining warm water into the bowl; stir to combine. 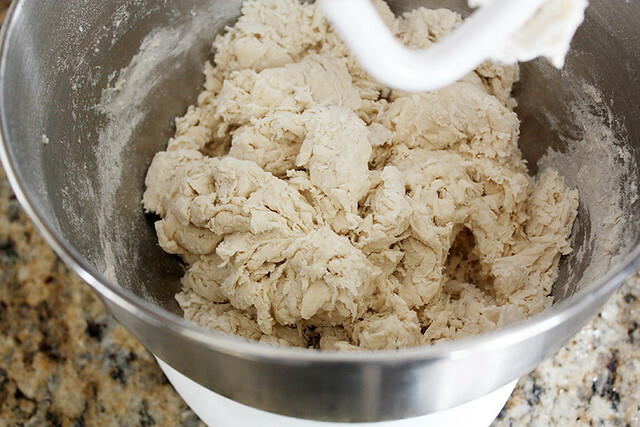 Mix, adding remaining water as needed until a smooth dough forms. Knead dough by hand on a lightly floured countertop, adding more flour as needed until a stiff, firm but smooth and elastic dough forms, about 10 minutes; OR, increase speed of stand mixer to medium and knead dough with a dough hook, adding more flour as needed until a stiff, firm but smooth and elastic dough forms, about 5-6 minutes. 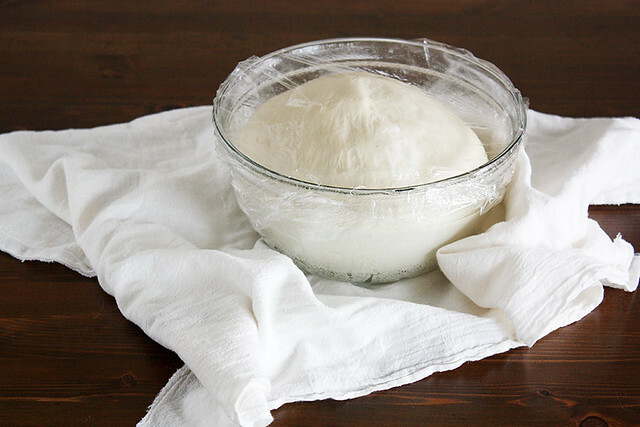 Shape dough into ball and place in a lightly greased bowl. Cover with plastic wrap or a tea towel and let rise in a warm place until doubled, about 1 hour (PRO TIP: If your kitchen is chilly in the winter like mine is, put the bowl in the microwave, on top of a towel-lined heating pad on the lowest setting or in an unheated oven with the oven light turned on). Once dough is doubled in size, punch down and let rest 10 minutes. Divide dough into 8 equal pieces. Roll each piece of dough into a smooth ball. Use your finger to poke a hole in the center of each ball, stretching the hole until it is as big as half the diameter of the entire bagel (it might look too big at first, but it will shrink when you boil/bake it). 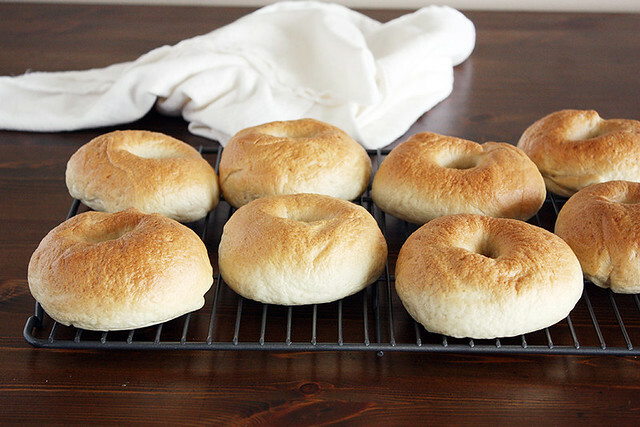 Place bagels on a lightly greased or silicone mat-lined baking sheet. Cover with a damp towel or lightly greased plastic wrap and let rest 10 minutes. Meanwhile, preheat the oven to 425 degrees F. Bring a large pot of water to a boil, then reduce heat to just below a simmer. Using a slotted spoon, lower a few bagels at a time into the water. Allow bagels to float to the top. Leave bagels in the water 1-2 minutes, then flip over and leave in the water another 1-2 minutes (the longer they stay in the water, the chewier they become). 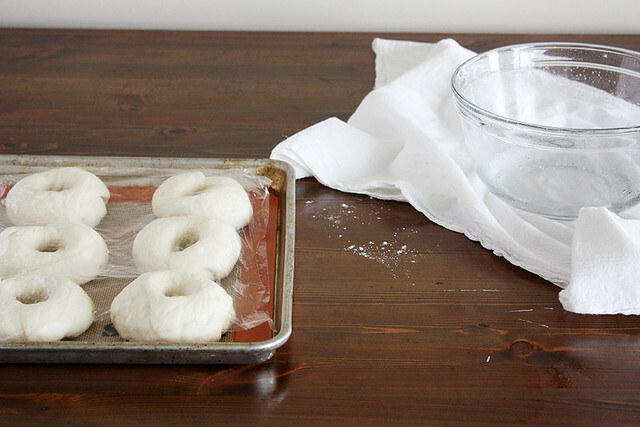 Remove bagels with slotted spoon and return to prepared baking sheet. Repeat with remaining bagels. Bake until golden brown, about 15-20 minutes. Remove from oven and let cool completely on a cooling rack before slicing. These look fab! Is that the raspberry compound butter from your previous post? I can only imagine how good that tastes on homemade bagels, especially if they’re still a little warm so it melts…mmm. Bagels are definitely on my 2013 bucket list! Rebecca — Thanks! 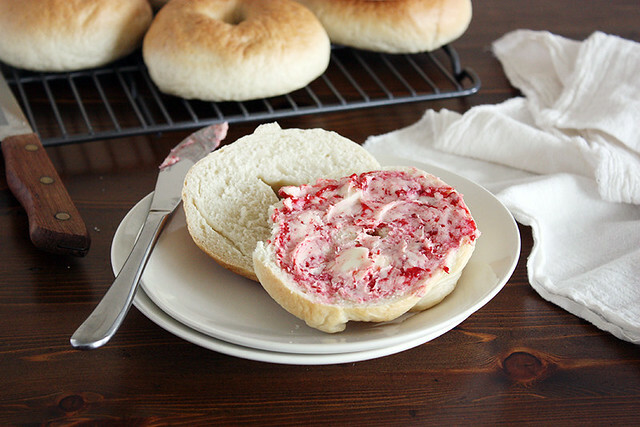 Yep, it is the raspberry-vanilla butter, and it is SO GOOD on these bagels. Oh my gosh – yum. These look just like NY style bagels! Jess — I so agree. 🙂 Thanks for the comment! Bagels! Oh how I love em’. I gotta try making these at home ASAP. Ashley — Bagels are some of the best things, ever. 🙂 Thanks for the comment! I just made bagels for the first time ever on Monday and LOVED them. 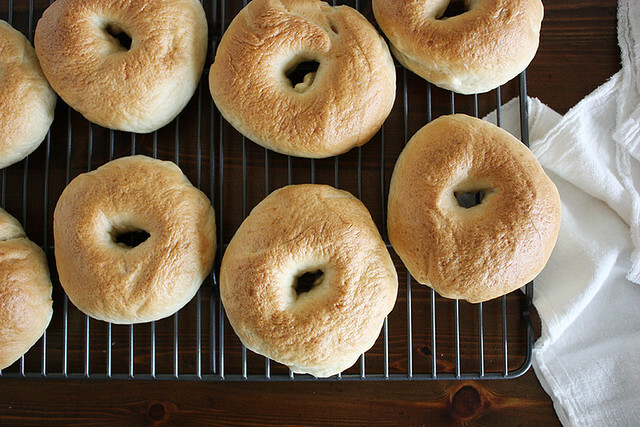 Seriously, how have I been living without homemade bagels? The recipe was pretty involved with started that you made, let sit for 24 hours… I’m going to try yours and see if all that extra work was really worth it or not! Melissa — Aren’t they AMAZING homemade? I’ve done this method and the 24-hour method, too… and I found they’re both tasty. 🙂 Thanks for the comment! Lucia — Hope you like them! I have cabin fever LIKE WOAHH right now. I want to freak. But these bagels.? better than NY deli. They are gorgeous! I made bagels once and it was a long drawn out process, I love that you can make these in an afternoon! Jessica — I know! Makes it so much more worth baking them from scratch, I think. Thanks for the comment! As a resident NY-er, I have to say these look pretty NY-style to me!! You done good, girl! I’ve been wanting to make bagels for ages, but they always seemed to much work. I’ll definitely give these a try! They look amazing, Stephanie! Caroline — I feel the exact same way, but these are sooooo much easier, I promise 🙂 Thanks for your sweet comment! Craig — Thanks for the comment! I do have Peter Reinhart’s book so I’ll have to check out the recipe. I love bagels! I seriously need to try making them at home. And the compound butter. And don’t ask me to share them! Anna — Girl, I totally wouldn’t share either. 😉 Thanks for the comment! I just made these, and they were incredible. Thank you so much for the recipe 🙂 it’s a definite keeper. Jerri — Absolutely! 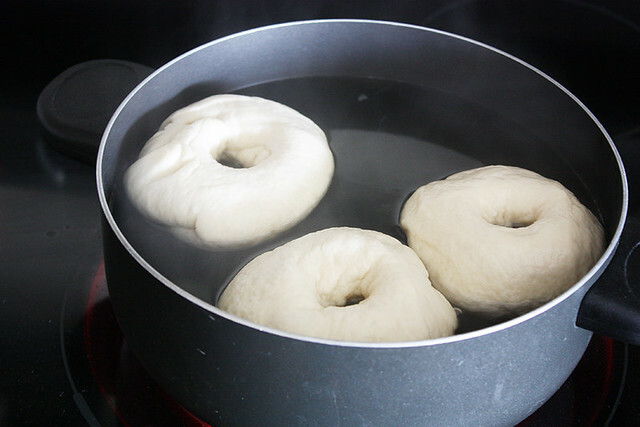 I might suggest that if you double or triple it, though, to use two pots of boiling water so 1) it doesn’t take FOREVER to make all the bagels and 2) the water stays fresh enough to do it’s thing. Hope you enjoy the recipe! I’m craving Cranberry Bagels. Think I can just add some craisins to your recipe or would I have to alter it in other ways? They look yummy. Schnackies — Oooh, yum! You could definitely just add some craisins to the recipe and be just fine (I wouldn’t add more than 1 cup max, though). Enjoy! I have made numerous bagels and the last few times they turn out wet after cooking. Could u help me figure out why? They also didn’t rise right. I bought new yeast. Could it be that that I needed more flour? Sally — Do you mean they come out wet after you bake them? By “wet,” do you mean the dough is very loose? If so, yes, I would definitely add more flour just until the dough can hold itself into a ball (if it acts more like a pizza dough, it’s too loose). It doesn’t sound like a yeast issue. Also, are you taking the bagels out of the water bath after about 2 minutes? That’s all they need in there, and maybe that’s a reason for the extra wetness. If I find out any more info about this, I’ll let you know!